All you want to do is deposit some money into your online poker player account so you can play a bit of real money poker. Sounds simple doesn’t it? However you find your way to the poker software’s Cashier screen and then you are hit with a multitude of poker deposit options, different payment methods that you can use to deposit with. In one way this is great as it offers many different ways of paying money into your account to suit everyone’s needs. It also allows you to choose your preferred method or the method that you have the most trust with to provide safety and security during your transaction. The leading online poker sites offer plenty of Deposit options, some of which you may not have even heard of! 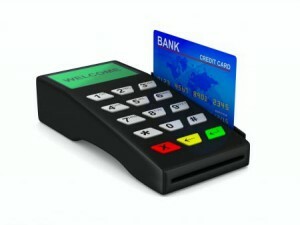 But you may not understand all the options and probably have not even heard of a lot of the payment methods available. So lets take a look at some of the common deposit options and payment method providers that the leading online poker sites accept. Most online operators will accept payments from all Visa / Master Card cards like Credit cards, Debit cards, ATM cards or check cards. You will need to provide the Card Verification Number which are the last three digits on the signature strip located at the back of your card. To use local bank transfer you first need to find out if this service is available in your country which will usually be detailed on the cashier screen. You can use this payment method with your normal online banking, telephone banking or at your local bank to instruct them to make a payment into your poker player account. It is as simple as making any of your other usual bill payment, but there may be a short delay before the cleared funds appear in your player account of up to 3 to 5 days. The Switch / Maestro card takes money from your UK bank account with one of the highest levels of security. You will need to provide either the Card Verification Number which is the last three digits on the signature strip located at the back of your card or the issue number found at the front of the card. The Solo card is one of the most used debit cards in the UK which deposits money straight into your Player account direct from your bank account. You will need to provide either the Card Verification Number which is the last three digits on the signature strip located at the back of your card or the issue number found at the front of the card. Neteller is an online E-Wallet account that you can use to send and receive money. 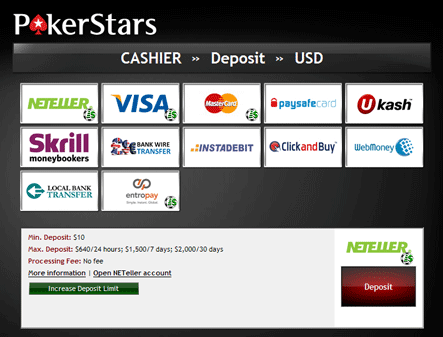 You can use Neteller to deposit money into your poker player account. First you need to have money in your Neteller account either from money that has been sent to you by someone else or by depositing money from your bank, credit card or debit card into your Neteller account. You can also make deposits using this method from an internet based bank account from either a UK, France, Spain, Germany, the Netherlands, Norway and Denmark. Please note you cannot deposit through Neteller using a US based bank account. Web Money works in the same way as Neteller. This is an E-Wallet account and again, first you need to deposit money into your Web Money account and then you transfer your funds to your poker player account. You are only usually only permitted to associate one Web Money account to your poker player account and once you have made your first transaction, you can never use a different Web Money account to make a deposit. This is a security method to ensure you and your E-Wallet accounts are protected from improper use. MoneyBookers is an account where you can wire money from your bank account or credit/debit card straight to your poker player account. Deposits are instantly made once the account has been verified and once at least one transaction has been completed. Using MoneyBookers is very secure as it uses a 128 bit encryption and Secure Socket Layer technology. You cannot however use MoneyBookers to wire money from any US or Turkish based bank accounts. The Pay Safe Card is a pre paid card where you do not have to use money from a bank account or credit card. You can buy the card from thousands of European outlets. All you have to do is enter the Pay Safe card Pin on your poker player account’s cashier screen to instantly deposit the money. Click and Buy is another way that enables you to transfer money to your poker players account. This is one of the most popular payment methods on the world wide web and is very easy to register an account. Ukash is a pre paid voucher or card which can be bought from any retailer that displays Pay Point, Pay Zone or E-Pay. This is an easy, fast and secure payment method where no fees are charged. There is usually a maximum deposit associated with this payment method so check the information displayed in the cashier screen for this payment method for full details. Cash Transfer is another payment method which allows you to quickly transfer money from most banks or retail outlets. You will not be charged by the online poker operator but the transfer agent will charge a fee depending on the amount of money sent. Due to the nature of this payment method there is usually a minimum deposit amount per transaction and you should check the information provided in the cashier screen for this method for full details. Entro Pay works as a virtual online Visa card to which you can top up funds using a credit / debit card anywhere in the world. The above are some popular deposit methods offered by leading online poker operators. It is by no means an exhaustive list and there will be some similar methods that are not mentioned here. Also not all operators will offer all the above payment methods and you will find some variation. Making a deposit into your online poker player account is actually very simple once you have chosen a preferred payment method. For most options it will be complete in a matter of a few minutes and the funds will be available for you to play poker with. As always, all the poker sites that feature on DownloadPoker.org have excellent customer service, so if you have any problems making a deposit into your player account, then do not hesitate to contact them and they will be sure to resolve your issue and help you deposit very quickly.